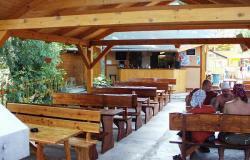 Recreation centre Margita-Ilona is situated about 6 km from Levice in direction of the town Šahy. are filled with a 25°C warm thermal water with minerals about 1020 mg/l. The novelty is the 71 m long toboggan with 25°C warm water. is possible in the hutted camp in 4 and 5-bed huts and 6-bed bungalows, apartments, campsite (caravansite). 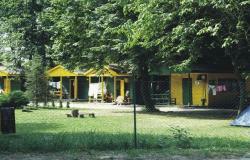 The camp is open from the beginning of may to the end of september. two rooms, shower, WC, terrace. Room about 21,6 m2 with 2 bunk-beds, furniture, TV; second room (kitchen) 14,7 m2 with fridge, hotplate, kitchen furniture with appliance, and two beds. two rooms, shower, WC, terrace. Room about 21,6 m2 with 2 bunk-beds, furniture; second room (kitchen) 14,7 m2 with fridge, hotplate, kitchen furniture with appliance, and two beds, bed clothes. room about 15,8 m2 with two bunk-beds, single bed, wardrobe, bed clothes, fridge, hotplate and kitchen appliance; veranda. two rooms (each 9 m2) with two bunk-beds, wardrobe, bed clothes, fridge, hotplate and kitchen appliance; veranda. The 4 and 5-bed huts have no bathroom - there are available public toilets and showers in the area. In the campsite (caravansite) there are available electric connections for tents and caravans. The are buffets offering fast food and restaurant direct in the area, shops with possibility to buy fresh fruit and vegetable or convenience food, dairies... Disposable is a selfservise kitchen in the area with hotplates. There is also possibility to order half or full board in the restaurant. For visitors is disposable a complex of playgrouns for adults and children direct in the camping area. 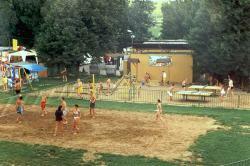 There are fields for beach volleyball, streetball, football, giant chess, tabletennis and a playground for kids. In the sport area there are available basketball, minifootball, volleyball and minigolf fields and tennis court or amusement room with billiard, tabletennis, darts, TV or a fireplace in the camp.